For the last two days the Wild Life Land Trust calendar has been sitting next to me as I have been working on my schedule for the coming year. The gaze of this Ocelot has been looking into my eyes constantly. After having the Moon Tiger dream which I wrote about recently, the power of those eyes looking straight into and through me has been riveting. I feel addressed deeply by this cat nature. Apparently Ocelots are also creatures of the night, like my Moon Tiger. And like me. 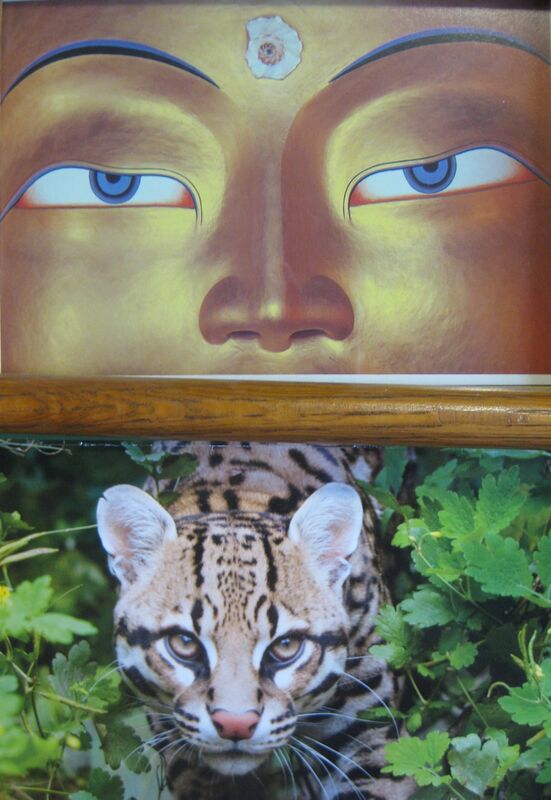 Last night I suddenly thought of a picture of Buddha’s eyes which I have framed in my office. I love this gorgeous image; it makes me feel seen, like Buddha love and Buddha presence are always right here looking at me. I took the picture off the wall and put the two sets of eyes together. Wow. Together they remind me of one afternoon years ago when as a young, working mother and a person who loves movies, I grabbed a chance to go to a double feature as suddenly both of my kids were taken care of on a day off. First I saw Wolf, with Jack Nicholson and Michelle Pfeiffer. The message went into me eerily that there is an animal nature built right in to each of us as humans, it just has to be triggered to be more keenly experienced. The next movie was Little Buddha, with Bridget Fonda. This one is about a search for the next incarnation of a Lama from a Tibetan village. This movie portrayed beautifully for me the message that Buddha is in all of us, not just one of us. I took these meanings powerfully to heart, and have loved keeping them both together there. These natures are equally, powerfully part of what makes us human. I have these eyes in front of me and will keep them there for some days. They are telling me something that belies words at the moment, so I wanted to share the picture. May they bless you in their gazes as they are blessing me. This entry was posted on February 18, 2011 at 5:46 pm and is filed under Uncategorized. You can follow any responses to this entry through the RSS 2.0 feed. You can leave a response, or trackback from your own site.